One of the advantages of GroupTweet.com is that it allows multiple contributors to Tweet from a group Twitter account using any Twitter app each of them prefers, whether that be Twitter for iPhone, Android, Twitter.com, Tweetdeck, Tweetbot, etc. However, we know some contributors don’t have personal Twitter accounts or don’t want to use their personal accounts to Tweet from their GroupTweet account. Therefore, we redesigned the GroupTweet dashboard so it works like a native iPhone or Android app. This makes it easy for GroupTweet contributors to help manage a Twitter account from their smartphones by performing actions such as replying to incoming @mentions, following or retweeting other users, and/or searching for any other users or tweets to interact with. 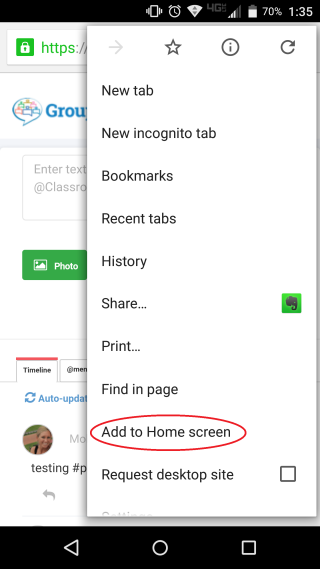 Follow the steps below from your smartphone to add a GroupTweet app icon to your smartphone homescreen so you can quickly and easily help manage your group’s Twitter account. Your group admin should have sent you your GroupTweet contributor invite link. 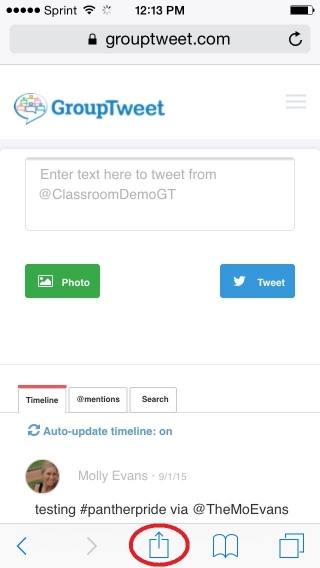 For demonstration purposes we will use the @ClassroomDemoGT link which is the following: Grouptweet.com/ClassroomDemoGT/a4ee352b17302ec80613218f4f212df2. 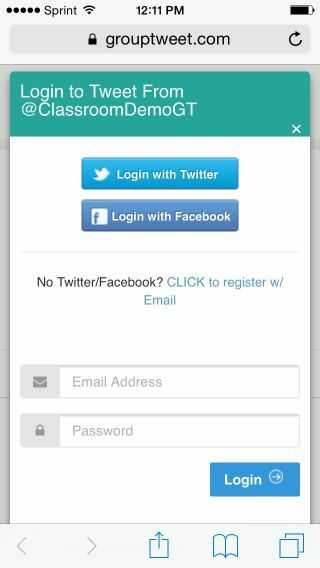 Once you click on that link it will take you to your dashboard login screen where you can register as a contributor by logging in with any of the following: 1) Your personal Twitter account, 2) Your Facebook account, 3) Your email address. If you choose to register with an email address after clicking the register link you will be able to enter you info and join as a contributor. 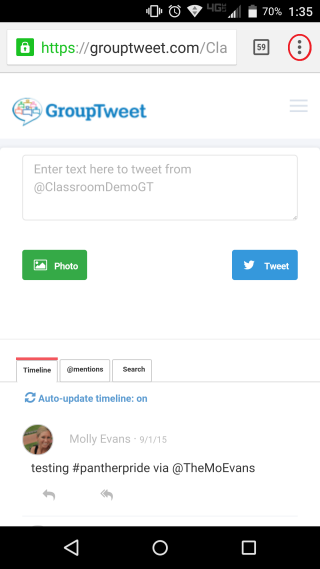 After registering or logging in, you are taken to your GroupTweet dashboard. As you can see below, the layout is designed to fit phone screens of all shapes and sizes. From here you can send Tweets from your group account, view and reply to @mentions, as well as search for any other Tweets or Twitter users to follow, reply to, retweet, etc. 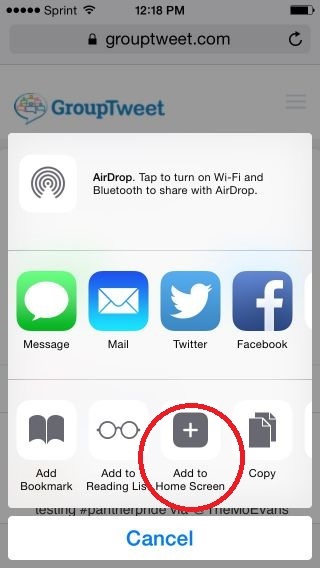 In each of the screenshots below – click on the icon circled in red to bring up the browser menu. That’s it, easy as that! 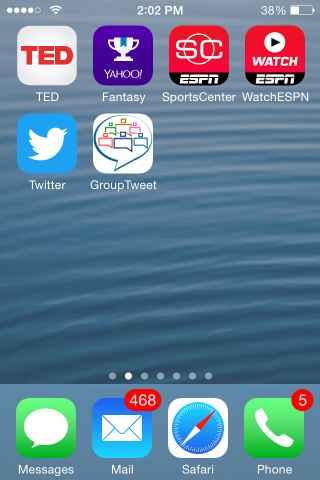 After tapping on “Add to Home Screen” you can customize the description for your GroupTweet app icon if you wish. Now that you have the icon saved, you can easily Tweet from your GroupTweet account. No more needing to login and out of multiple Twitter accounts. Simply tap on your GroupTweet icon as seen below and you are ready to Tweet!